വിഷത്തിന്റെ കാഠിന്യം കണക്കാക്കുവാൻ എലികളിൽ നടത്തിയ പരീക്ഷണങ്ങളിലാണ് ഇവയുടെ വിഷം കടൽപാമ്പുകളെക്കാൾ മാരകമാണ് എന്ന് കണ്ടെത്തിയത്. മനുഷ്യന്റെ ഹൃദയഭിത്തികളിൽ ഏറ്റവും മാരകമായ ആഘാതം ഏൽപ്പിക്കുവാൻ ഇവയുടെ വിഷത്തിനു കഴിയും. മറ്റു പാമ്പുകളെ അപേക്ഷിച്ച് ഇവ സസ്തനികളെയാണ് വേട്ടയാടുന്നത്. ഉഷ്ണരക്തം ഉള്ള ജീവികളെ വേഗത്തിൽ കൊല്ലാൻ ഇവയുടെ വിഷത്തിനു കഴിയുന്നു. ഇവയുടെ ഒരു കടിയിൽ തന്നെ 100 പൂർണ്ണവളർച്ച എത്തിയ മനുഷ്യരെ കൊല്ലാൻ ഉള്ള വിഷം ഉണ്ട്. ഉടനെ ചികിത്സ കിട്ടിയില്ലെങ്കിൽ 30-45 മിനുട്ടുകൾക്ക് ഉള്ളിൽതന്നെ രോഗി മരിക്കുന്നു. ഇവയുടെ വിഷത്തിനു ഇത്രയും മാരകമായ കാഠിന്യം ഉണ്ട് എങ്കിലും ഇവ വളരെ ഒറ്റപ്പെട്ട ആവാസ സ്ഥലങ്ങളിൽ ആണ് കാണപ്പെടുന്നത്, ഇവയ്ക്ക് മനുഷ്യരുമായി സമ്പർക്കം തീരെ ഇല്ലാത്തതിനാൽ ഇവയെ മനുഷ്യർക്ക് ഏറ്റവും അപകടകരം ആയ പാമ്പുകളിൽ ഒന്നായി കണക്കാക്കുന്നില്ല. ↑ Fohlman, J. (1979). "Comparison of two highly toxic Australian snake venoms: The taipan (Oxyuranus s. scutellatus) and the fierce snake (Parademansia microlepidotus)". Toxicon. 17 (2): 170–2. doi:10.1016/0041-0101(79)90296-4. PMID 442105. ↑ White, Julian (November 1991). Oxyuranus microlepidotus . "Neurotoxic paralysis usually takes 2-4 hours to become clinically detectable. Coagulopathy however may become well established within 30 minutes of a bite" International Programme on Chemical Safety. Retrieved November 8, 2013. ↑ 7.0 7.1 Queensland Snakes . History & Discovery. (archived) Queensland Museum. Retrieved November 15, 2013. ↑ Rediscovery. 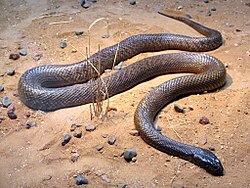 The Rediscovery of the Western Taipan. (archived) Queensland Museum. Retrieved November 15, 2013. Shorter, Damon. 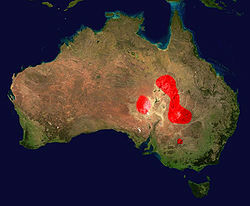 Great Australian bites – Three of the worst. Australian Broadcasting Corporation. Retrieved October 16, 2013. Inland Taipan Oxyuranus microlepidotus. venomsupplies.com. Retrieved October 18, 2013. "REPTILES – FIERCE SNAKE" . Australia Zoo. Retrieved October 14, 2013. Martin, Stella (January 2004). Newsletter No. 80. "It has been calculated that there is enough venom in just one bite of an Inland taipan to kill more than 100 men of average size." Environmental Protection Agency (Queensland). Retrieved October 18, 2013. Carbone, Nick reporting on Steve Irwin (September 04, 2011). Remembering Steve Irwin: The 5 Most Memorable Crocodile Hunter Videos "Steve Irwin Plays with Inland Taipan (Fierce Snake)". Time (magazine). Retrieved October 15, 2013. White, Julian (November 1991). Oxyuranus microlepidotus . "Neurotoxic paralysis usually takes 2-4 hours to become clinically detectable. Coagulopathy however may become well established within 30 minutes of a bite" International Programme on Chemical Safety. Retrieved November 8, 2013. Division of Medical Toxicology. "Summary for Human Bite by Inland Taipan (Oxyuranus microlepidotus)". University of California, San Diego. Retrieved October 15, 2013. Welton, Ronelle Ellen (2005) PhD thesis. Proteomic and genomic characterisation of venom proteins from Oxyuranus species. "studies have shown that inland taipan venom has a higher hyaluronidase activity compared to coastal taipan venom" . James Cook University. Retrieved November 15, 2013. Gardiner, Stephanie (September 27, 2012). "Mystery over boy bitten by world's most venomous snake ". (Quoting Julie Mendezona, Head keeper of Reptiles and Spiders, Australian Reptile Park) The Sydney Morning Herald. Retrieved October 14, 2013. News from Australia (September 27, 2012). Deadly Taipan snake may have been a pet: catcher. (Quoting licensed reptile handler, Barry Martin) australiantimes.co.uk. Retrieved October 18, 2013. ഈ താൾ അവസാനം തിരുത്തപ്പെട്ടത്: 10:42, 4 ജനുവരി 2018.